Order Aerion at your local retailer or online through our website today! We caught up with Shadi Torbey, designer of the Oniverse games, to discuss the latest game: Aerion. 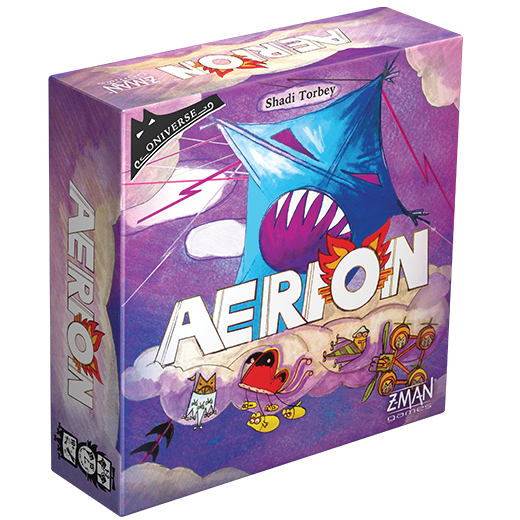 Aerion is a solo/cooperative game for one to two players. 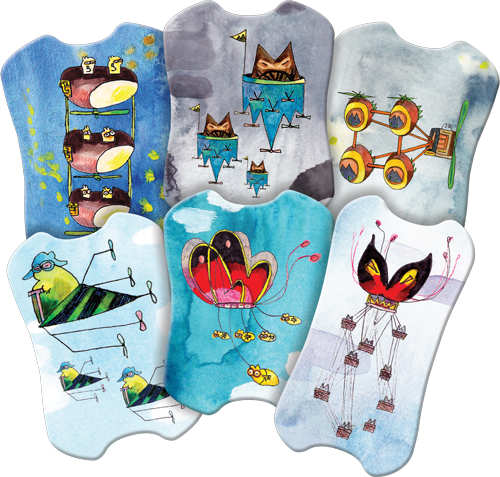 Your goal is to build six airships to create the most beautiful fleet in the Oniverse. By rolling dice and managing your resources, you must find the best blueprints, materials, and crew for each ship. Can you build the best fleet in time? 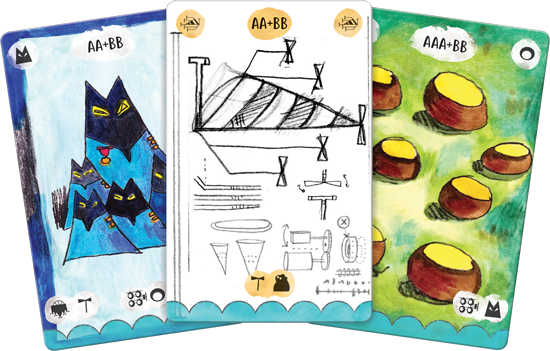 Pre-order your copy of Aerion from our webstore or your local retailer and read on for Shadi's designer diary about the creation of this exciting new title. Aerion started with a simple, mean idea: A dice game where you had to acquire resources by rolling different results (two pairs, full house, 1 through 5, etc. ), but rerolling your dice to try to get those results would come with a cost: you'd have to pay for those rerolls by discarding the very resources you were trying to acquire! Aerion was the result of this idea. In Aerion you are a well-known air-shipwright tasked by the Archonts to build a new fleet of ships to traverse the skies of the Oniverse. The object of the game is to build six airships before your resources run out. You need three resources (cards) for each ship: a blueprint to work off of, materials to build it, and a crew to fly it. Two ships may need the same crew but different materials so you'll have to manage your resources carefully as you construct each ship. You do have on more powerful asset that won't directly help you build ships, but does have multiple powerful effects: Books. Book cards can be used to reroll dice, recover discarded resources, or stockpile resources for later. With the right roll, you can acquire one of the six available cards in the Display. If you need a different roll to acquire the card you want, you can discard cards from the Display to reroll. You can keep trying until you either acquire a card or burn through all the cards currently in the Display trying! The Display isn't refreshed with new cards until the end of your turn, so you'll need to work with what's in front of you. Discarding cards from the Display doesn't just limit your options, it brings you closer to defeat. If the six decks run out before you complete your task, you lose the game! The airships take shape in your Workshops, where you place the resources you've acquired. You can gather the materials and blueprints however you want, but your crews won't just sit around waiting for the ship to be skyworthy; you'll need to recruit them last once your ship is built. Let's say that last turn you acquired the cocoon material card and put it into one of your Workshops. You could build one of two ships in that Workshop. Now you roll the dice, and this is what you get: 2/2/5/5/3/6 with this cards in the display: incubus, cocoon, blueprint, sognae, book, blueprint. What should you do? Your dice result has two pairs which lets you acquire the incubus crew, but you don't need it yet. You have to get the blueprint first for the ship they're supposed to fly and that ship's blueprint isn't in the Display. If you can just roll another 5 or 2, you could get a blueprint that goes with the cocoon you already have. Or you could try to reroll for four of a kind to get the always useful Book card. Or if you can just roll a 4, you would have the series of sequential numbers necessary to acquire a different blueprint to put in your second Workshop space. So what will you do? Which dice will you reroll? And, more importantly, whiuch card from the Display will you discard to do so? You must make careful choices to win. From the start of the design process, it was clear that I couldn't have all the resource cards in a single deck since this could lead to cards being drawn in unwinnable or unfun combinations. So, I separated the cards into six prese "mini decks" based on the roll necessary to acquire each card. As expected, this led to a much more reliable distribution of cards in the Display. A happy side effect was that Aerion became something more than just a dice game. Since players know which cards are left in each small deck, you need to choose which cards to try for and which to discard based not only on which card you want right now, but also on which cards you can afford to discard. Aerion is still a dice game, but with the card structure it's more than that. I've started to think of it as a deck management game. When designing Oniverse games, building the expansions is always a fun and stimulating challenge: how far can I push the game's core mechanic and add (or, in certain cases, remove) elements without the whole thing falling apart? Aerion includes six expansions to alter your journey through the skies, presenting new challenges for players to conquer. One element was time. 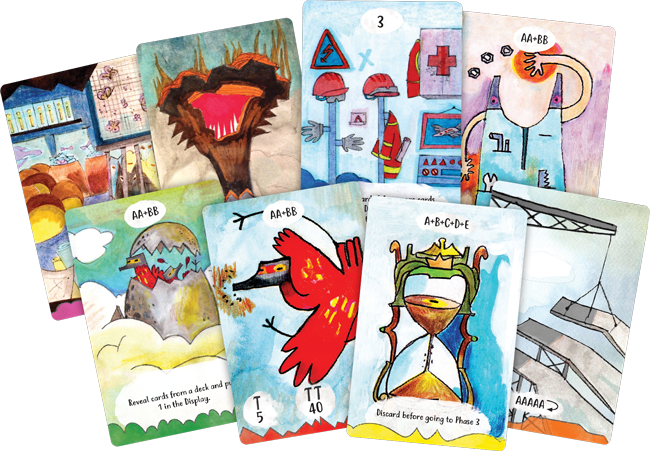 The Hourglasses expansion adds a particularly nasty bit of time pressure behind acquiring the namesake cards: you must acquire one of each Hourglass card to win the game, but each Hourglass will only be in the Display for one turn! This naturally got me thinking about the reverse: what about cards that you want to keep in the Display as long as possible? This led to The Stone Clouds expansion. The cloud tokens must be cleared to launch your airships. You'll need to enlist the aid of the trust Hammer Birds to do so. Hammer Birds can't be acquired, but can be discarded from the Display to add to the total number you need to destroy the Stone Clouds. The more Hammer Birds work together, the better the result! 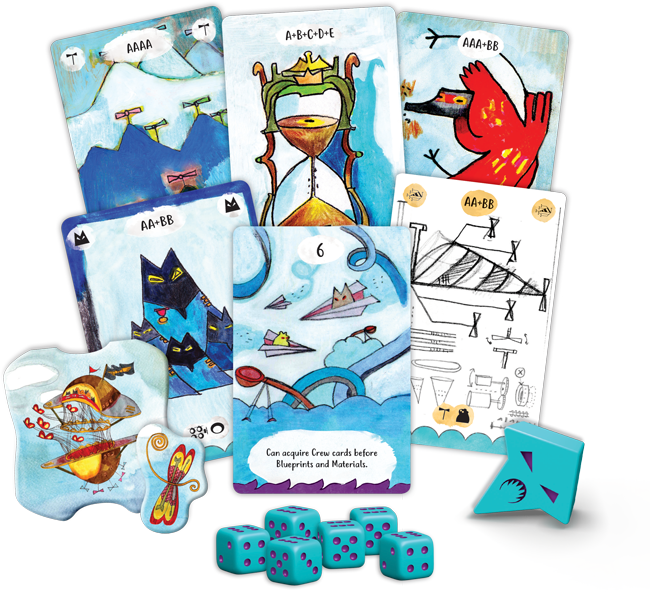 Aerion's base game presents the player with this fundamental dilemme: which card should I try to acquire, and which cards can I afford to discard for rerolls to make that happen? The Stone Clouds expansion introduced an incentive for keeping cards in the Display until you had multiple copies available, but I wanted to try a different twist on this dynamic as well: what about a card that you could discard for a more powerful reroll, but with a cost? The Workers featured in The Piers expansion can work overtime to give you three rerolls instead of one when you discard them, but you'll need to give them their payday later in the game with a roll totaling 26 or more. The Workers come with their own additional challenge: building the piers necessary to properly launch their airships you've built. The Piers expansion (and, to a lesser extent, The Stone Clouds expansion) make high rolls valuable. But one quality I've aways admired in dice games is finding ways to make low rolls useful in their own way. In Aerion, your low rolls can be used for one of the most difficult tasks of all: hunting our newest villain, the fearsome Hellkite! This vicious predator of the skies lurks in far-flung Outposts, preventing you from acquiring the card type shown on the Outpost he is currently on. Fleeing from your hunt to Lairs packed with the plunder of past raids, the Hellkite must then be confronted in the heart of his domain where you can reclaim stolen resources and liberate captured crews. When designing expansions, I always aim to ensure that they are fun to play in any combination—including all of them at once! Playing with the Workers, Hammer Birds, and Hourglasses together almost doubles the card count in each deck, so a bit of judicious deck manipulation was in order. Plus, there was another facet of the design I still wanted to explore: cards that could never be discarded from the Display. The Hammer Birds have been faithful friends more than once on our journeys, so now it’s time to do a favor for them: return the Hammer Bird Eggs to their homes without letting a single one break! Egg cards can never be discarded from the display, but once you recover them safely, their grateful parents will reward you by searching the decks for you and retrieving the cards you were looking for. Once I established a core concept and a series of variations on the central theme, clearly the only thing left to do was throw all of that out the window and let players cheat! The obligation to put acquired cards in the workshops? Gone (well… almost)! Now you have a seventh ship to build: The Flagship, which serves as its own workshop and blueprint: all you have to do is to gather one copy of each material and of each crew. This additional ship clearly makes the game harder, so players get two cards that let them bend the rules a bit: the Factory cards. Each Factory card gives you new capabilities that let you break some of the core rules of the game: no free rerolls? The geniuses down in the Research Lab can shake that up! You must continue to discard cards until you can acquire something? The Security Department can put a stop to that. The crew has be added last? Not if you can keep them entertained in the Game Room! Other Factory cards can make your Books more effective, or modify your rerolls to let you turn a die to its opposite side instead (this one’s a special treat for players who prefer a little less randomness in the game). With the core game and six expansions, Aerion is a great addition to the Oniverse and to any gamer's library. Play solo or grab a partner to tackle the Archonts request. The skies of the Oniverse are waiting. Grab your dice and build some airships!